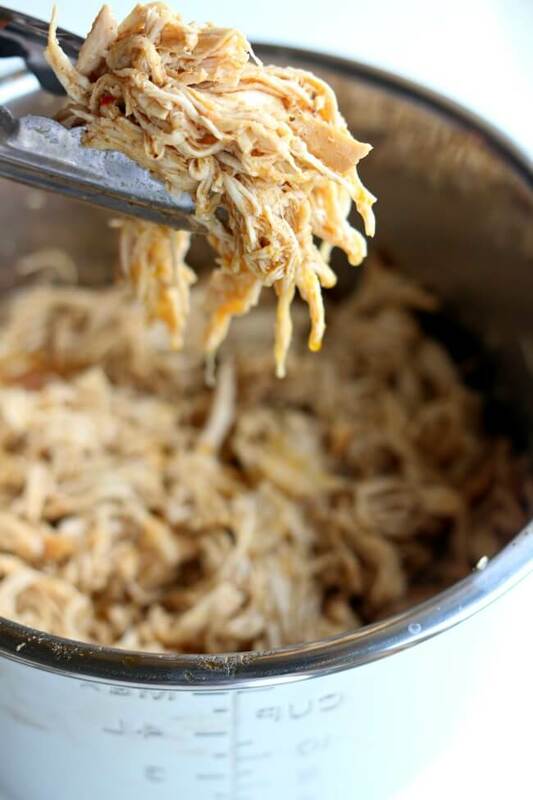 Everyone in Utah loves to go to Cafe Rio, and this Instant Pot or Slow Cooker Cafe Rio Chicken is an easy way to make that delicious Cafe Rio chicken at home for a tasty Taco Tuesday dinner! These recipes for Instant Pot or Slow Cooker Cafe Rio Chicken from 365 Days of Slow + Pressure Cooking will let you make tasty Cafe Rio food at home! You’ll love how easy this chicken is to make, and if you’ve eaten at Cafe Rio, you know it’s good! Karen uses a combination of chicken breasts and thighs for this recipe for best flavor, and this delicious, moist Cafe-Rio style chicken is ready to serve in about 45 minutes total time using the Instant Pot. Or use the link to make the slow cooker version of Cafe Rio Chicken in 5-6 hours if you prefer that method. Layer the Instant Pot or Slow Cooker Cafe Rio Chicken with a tortilla, rice, beans, lettuce, and that famous Cafe Rio Style Creamy Tomatillo Salad Dressing if you want the salad they serve in the restaurant, or use the flavorful chicken in tacos or add the rice and beans and make it into a burrito. Either way you serve this your tastebuds will be happy. And I bet the whole family will enjoy tonight’s dinner featuring Instant Pot or Slow Cooker Cafe Rio Chicken made at home! Get the complete recipe for Instant Pot Cafe Rio Chicken from 365 Days of Slow + Pressure Cooking. Get the complete recipe for Slow Cooker Cafe Rio Chicken from 365 Days of Slow + Pressure Cooking if you prefer that method. Click here to see all the Chicken Recipes! Really love your journey, congrats!